The Cayman Islands have culinary options to suit any palate. Caymanian food reflects the rich cultural heritage of our islands and incorporates several international flavours. Anything you can make with conch, coconut, plantain, cassava, yams, rice and peas, tuna, snapper, mangos and mahi-mahi, has been prepared in the Cayman Islands. 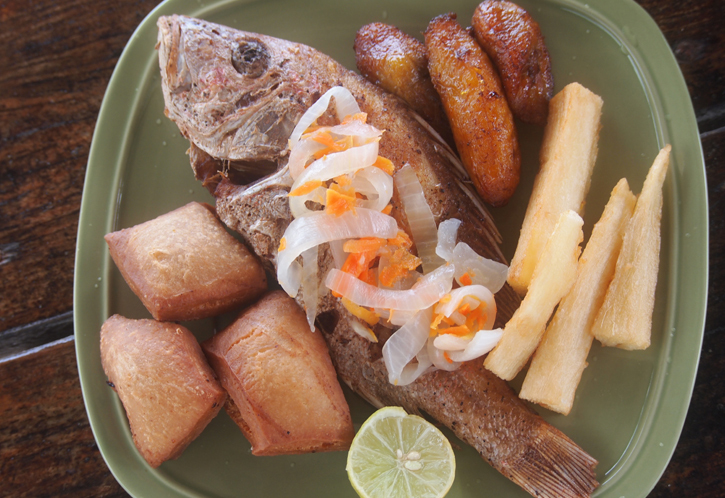 Food in the Cayman Islands includes traditional Caribbean fare. Jamaican cuisine has also found its way on to many of the menus of the Cayman Islands and jerk seasoning has become popular on several meat dishes. Curries are also frequently used throughout Cayman. You can find all of these ingredients and most of your favourites in our grocery stores. Traditional Cayman food includes dishes made of turtle meat, as well as conch stew, Cayman-style beef, and an old fashioned fish fry. Of all the local deserts, heavy cake is a mainstay. Bring coconut milk to a boil. Add sugar, stirring until completely dissolved and continue to boil for about 45 minutes. Reserve 1/2 cup of the coconut milk/sugar mixture for later. Combine remaining ingredients in a large mixing bowl, stir until well blended. Add hot coconut milk mixture and stir well. Mixture should be of a thick liquid texture. Use 2 tablespoons of coconut milk mixture to grease 9” baking pan. Pour batter into prepared baking pan and bake at 350ºF (basting occasionally with reserved coconut milk mixture) for 2 1/2 to 3 hours or until knife inserted in centre comes out clean. Spread any remaining coconut milk mixture over top of cake. Place cake on top of stove to cool completely. Clean conch meat and pound to tenderise. Boil conch for 2 to 3 hours or until tender. Once cool, cut conch into bite size pieces and season. Add all ingredients, except flour, to pan and simmer for 10 to 20 minutes. Make sea pie while conch cooks . Mix flour with 1 cup water and pour into pan to thicken. Add sea pie pieces and continue to cook for an additional 10 minutes. 4. Make dough with flour, pinch of salt and water, so that you can roll out as thin as possible, then cut into 2 1/2” x2 1/2” squares. Let set for half an hour then stretch squares to thin them out and add to conch stew mixture. Tenderize the Mahi-Mahi and marinate with fresh garlic, salt and pepper. Mold the crab meat and shrimp on the Mahi-Mahi then roll and secure the end with a tooth pick. Bake in 350 degree oven for 20 minutes or until fully cooked. Top with a lemon butter sauce. Saute the onion and garlic over medium heat with the salt until cooked but not coloured. Add all of the spices and toast them, add the apple juice, pineapple juice, vinegar mirin and honey and bring to a boil. Thicken with the whitewash to the consistency of jelly. Let cool to room temperature, and add the apples and tropical fruit. Cut each ﬁlet in half, top with some of the chutney, stack the other piece on top and re-top with more of the chutney...enjoy! Boil sugar, water and lime in a pot for one hour then pour into a greased baking pan. Make sure you have water in a bath pan and then set the baking pan in the bath pan to make the mixture cool so it can be handled. After it has cooled the mixture is "pulled" traditionally on a nail. The "pulling" of peppermint candy is similar to pulling taffy. The mixture is stretched by hand and long strands of peppermint candy are then cut into small pieces of candy. You wait for it to turn white then bore a hole into the mixture and put 3-4 drops of peppermint oil - continue to "pull" the mixture over the nail for 10-15 minutes to allow the peppermint oil to fully mix through. Then take it off the nail and lay it out on a floured surface (to avoid sticking) and cut into pieces.